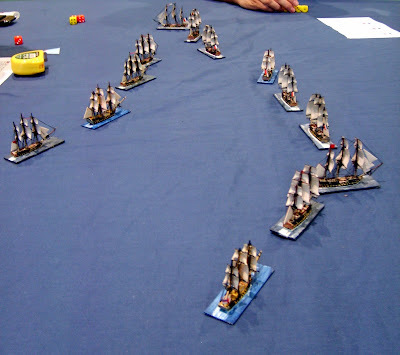 Post Trafalgar scenario with the Brits hunting down the French in the Caribbean. A single French line trying to escape from two smaller British lines catching them up. 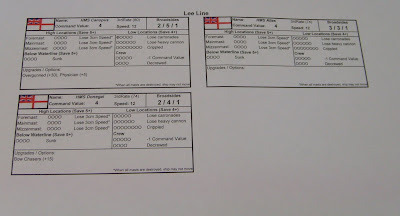 Given the starting positions my line was lucky to reach the last french ship at all. We received a bit of fire from it but were pretty much untouched during the rest of the game. My lead ship managed to get a bow rake in but that put the ship in a position where it could never catch up. Even after taking the risk of going to full sail it was a stretch to reach them. The tailender final struck his flag just as my other ships were lining up. And this is where the game came to a close. Can't say what the rules are like as already house rules are being used before I've had a chance to play the originals. Firing arc changes and the need to confirm Criticals. Also a lot of discussion about the wind template and how you can sail at almost full speed into the wind. I dislike the critical house rule as damage from crits are not of the usual roll 6 and explode that you might expect so didn't really need tweaking. 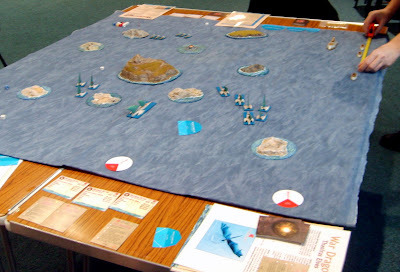 Despite being quick play I could not describe them as fun, unlike Uncharted Seas, the fantasy naval game, which was also being played on another table. They managed to get two eventful games finished in the time it took for ours to fade out. Trafalgar is sort of an halfway house rules set, the Navy buffs at the club commended the book for its historic details but not for the way they were implemented. Uncharted Seas is generating quite a bit of interest in the club, even from the 40Kers and RPGers. 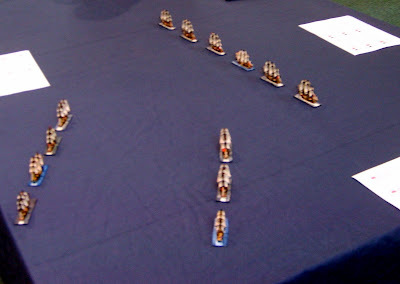 Graeme has currently got three fleets worth and is trying to tempt people into playing. If a few more jump into the game then I would seriously consider getting a fleet myself. Colin managed to win both games with some killer combo cards to make up for his two hammerings last week.